The chairman of a Tyneside arts complex at the centre of a police investigation has defended staff who alerted police to a potentially pornographic exhibit. A photograph called "Klara and Edda belly-dancing" by Nan Goldin, was seized by police from Gateshead's Baltic Centre last week. 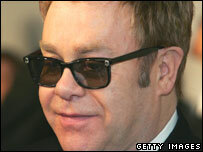 It was one of 139 photos in a Goldin exhibit owned by Sir Elton John. 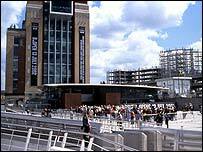 Baltic chairman Sir Ian Wrigglesworth praised staff, who he said "did the right thing" by alerting police. A spokesman for Sir Elton said the photograph, of two naked young girls, had been exhibited around the world without objections. Northumbria Police is now investigating and is taking preliminary advice from the Crown Prosecution Service (CPS). Mr Wrigglesworth said: "We had an exhibition of 139 photographs and the management of Baltic thought this particular one was possibly beyond the pale. "So the management took advice from the police as to whether it should be put on display or not. "That led to a police investigation, which is ongoing. "When that doubt was raised about this particular one, advice was taken and I think the management behaved extremely responsibly, and did what most people in the public would want them to do." A statement on Sir Elton John's website said the image, part of the Thanksgiving exhibition, was from a monograph of the American photographer's works entitled "The Devil's Playground". It was offered for sale at Sotheby's New York in 2002 and 2004, and exhibited in Houston, London, Madrid, New York, Portugal, Warsaw and Zurich. The statement added: "Elton John is known as one of the world's foremost collectors of photographic art and has several thousand photographs in his collection, including works by Man Ray, Richard Avedon, Irving Penn, Diane Arbus and Ansel Adams." Goldin, 54, who is well known for using semi-naked models, was not available to comment. A Northumbria Police spokeswoman said: "We attended the Baltic last Thursday at the invitation of management, who were seeking advice about an item from an exhibition prior to it going on public display. A gallery spokeswoman said no exhibitions were being removed as a result.